Golüke S, Bischof H-J, Engelmann J, Caspers B A and Mayer U. Social odour activates the hippocampal formation in zebra finches (Taeniopygia guttata) Behavioural Brain Research: 364, 2019, 41-49. doi.org/10.1016/j.bbr.2019.02.013. R Perrone, F Pedraja, G Valiño, B Tassin and A Silva. Non-breeding territoriality and the effect of territory size on aggression in the weakly electric fish, Gymnotus omarorum acta ethologica, 2019. 1-11. doi.org/10.1007/s10211-019-00309-7. Wolf-Homeyer S, Engelmann J and Schneider A. Application of reduced sensor movement sequences as a precursor for search area partitioning and a selection of discrete EEV-contour-ring fragments for active electrolocation Bioinspiration & Biomimetics. 13(6):066008. doi: 10.1088/1748-3190/aae23f. Fechner S, Grant K, von der Emde G, Engelmann J. Physiological evidence of sensory integration in the electrosensory lateral line lobe of Gnathonemus petersii Plos One. 13(4): e0194347. Nagel R, Kirschbaum F, Engelmann J, Hofmann V, Pawelzik F, Tiedemann R. Male-mediated species recognition among African weakly electric fishes Royal Society Open Science. F Pedraja, V Hofmann, K M. Lucas, C Young, J Engelmann and J E. Lewis. Motion parallax in electric sensing. PNAS 2018 January, 115 (3) 573-577. Chagnaud B., Engelmann J, Fritzsch B, Glover JC and H Straka. Sensing external and self-motion with hair cells. A comparison of the lateral line and vestibular systems from a developmental and evolutionary perspective. Brain Behav Evol. 2017;90(2):98-116. Hollmann V, Hofmann V and Engelmann J. A somatotopic map of the active electrosensory sense in the midbrain of the mormyrid Gnathonemus petersii. J Comp. Neurology 5;524(12):2479-91. Hollmann V, Lucks V, Kurtz R and Engelmann J. Adaptation-induced modification of motion selectivity tuning in visual tectal neurons of adult zebrafish | Journal of Neurophysiology 114: 2893–2902, 2015. 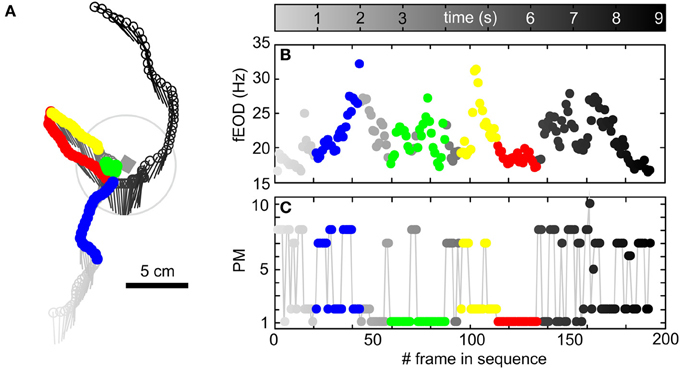 Goulet, van Hemmen, Jung, Chagnaud, Scholz and Engelmann (2012) Temporal precision and reliability in the velocity regime of a hair-cell sensory system: the mechanosensory lateral line of goldfish, Carassius auratus . | J Neurophysiology,107: 2581-2593. Metzen MG, Engelmann J and Gerhard von der Emde. (2008) Size, structure, and distribution of receptive fields of neurons in the electrosensory lateral line lobe of the weakly electric fish, Gnathonemus petersii. | J Comp Physiol A. DOI 10.1007/s00359-008-0377-4. Pusch R, von der Emde G, Hollmann M, Nöbel S, Bacelo J and J. Engelmann. (2008) Active Sensing in a Mormyrid Fish – Electric Images and Peripheral Modifications of the Signal Carrier give Evidence of Dual Foveation. | J Exp Biol 2008 211: 921- 934.
 van den Burg EH, Engelmann J, Bacelo J, Gomez L and Grant K. (2007) Etomidate reduces initiation of backpropagating dendritic action potentials: implications for sensory processing and synaptic plasticity during anesthesia. | J Neurophysiol. 2007 Mar;97(3):2373-84. Chagnaud BP, Bleckmann H, Engelmann J. (2006) Neural responses of goldfish lateral line afferents to vortex motions. | J Exp Biol. ; 209: 327-42. Engelmann J, Hanke W, Bleckmann H (2002) Lateral line reception in still- and running water. | J Comp Physiol A 188: 513-526.